The home plan presents an elegant facade dominated by graceful arched windows. Traditional Mediterranean details are apparent in the red tile roof, stucco exterior, and varied roof lines. The Olde World elegant exterior is counter-pointed by a thoroughly contemporary flow with all the imaginable amenities. Some of the special features of this house plan are the library for quiet relaxation, a full bath for each bedroom and a wonderful spa like master bath. This is a great custom designed house plan--don\'t pass it up! 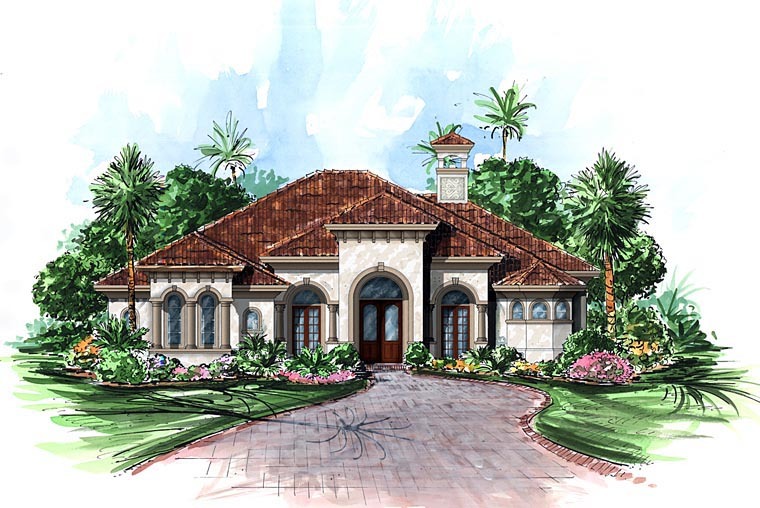 This Mediterranean house plan originally designed for Naples, Florida has found its place in many tropical atmospheres such as Belize, Virgin Islands and coastal communities like California and Texas.